A defensive end for the Clemson Tigers in college. Ricky Sapp got the nod to play as a backup going into his true freshman season in 2006, after earning USA Today All-American honors in High School. He finished his 4 year career at Clemson starting 36 games, with 160 total tackles, 16 sacks, and 41 TFL. NFL draft pundits pegged Sapp as an outside linebacker/ defensive end. A definite ‘tweener’ (6’4″, 242) Sapp is an ideal candidate to be a team’s designated pass rusher in a 3-4 defense, but as he hadn’t really been tested in pass coverage leading up to the draft, his stock shot up and fluttered. 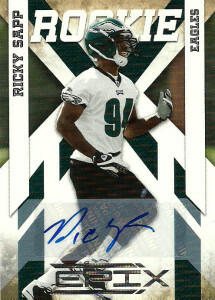 With a few moves and quickness off the snap, Ricky was drafted primarily on his athleticism. The Eagles took him in the 5th round of the 2010 draft but blew out his knee in camp. Cut in 2011, the Jets picked him up where he has seen time primarily on the practice squad since then. Head coach Rex Ryan liked his overall tool set, but with Ryan on the hot seat and Sapp in his final year of PS eligibility, Ryan had to make some moves with a new GM looking over his shoulder. Ricky was released by the team when they signed Ed Reed off of waivers. Ricky didn’t have to wait too long as he’d be scooped up by the Houston Texans, and in 2014 made the active roster.